Upcoming Event: Fashion Valley, Glamour and GQ Team up for LOOKBOOK Live! 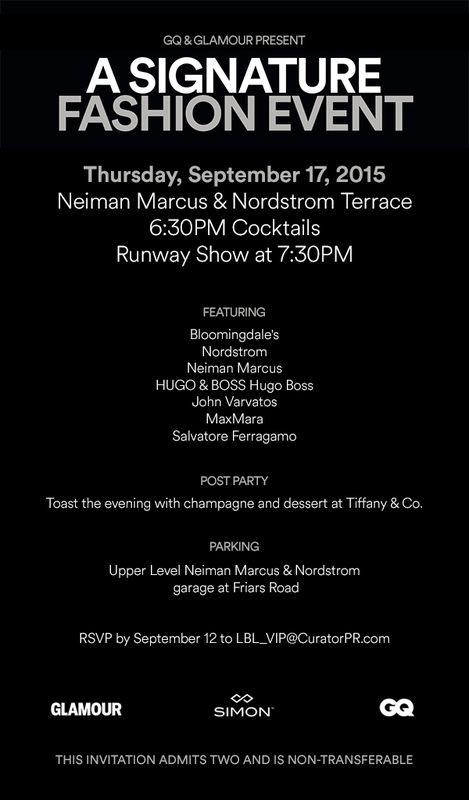 Fashion Valley with Glamour and GQ magazines present a fantastic event on September 19, 2015 from 1pm to 5pm called LOOKBOOK Live, which will bring the hottest trends to life with style experts from Glamour and GQ magazines, along with a whole host of fashion and beauty related events and activities, including a contest for a chance to win a $2500 shopping spree! Stage Events: Style experts from Glamour and GQ will showcase and discuss fashions worn by male and female models. Style Closets: Trend-themed closets will feature his-and-her styles for different fall dates and occasions. Professional stylists will be on hand to help shoppers interpret which looks best fit their lifestyles, body types and budgets. Beauty Stations: Complimentary beauty and grooming touch-ups, tailored to the different style closets, will have shoppers date-ready in a flash. Style Challenges: Engaging activities held every hour that will challenge shoppers to pack a suitcase with their style picks for a selected destination. Style experts will choose the winning suitcases and winners will receive gift card prizes. Shop This Look: All merchandise in the Style Closets will be available for purchase at Fashion Valley retailers. “Shop This Look” cards will be filled out by the style experts so they can reference them as they shop. Additionally, a special contest on event day will reward shoppers who purchase their favorite looks at Fashion Valley. Photo Booth: Snap a shot with your boyfriend, girlfriend or BFF and share on social media, or print and take it home as a style souvenir. Enter for a Chance to Win a $2,500 Shopping Spree: Shoppers who post a photo of their favorite fall look, inspired by these trends, to Twitter or Instagram using both #foundatsimon and #gqglamourcontestentry will be entered to win a $2,500 Simon shopping spree. Additionally, there will be a VIP invite-only event to be held on Thursday September 17, to showcase some of the looks that will be presented on Saturday. For those who want to attend, please RSVP quickly to the email below because the deadline is tomorrow!